A supple leather chair or couch is a beautiful addition to any home, but leather requires different care than other types of furniture. If you know a few easy techniques, caring for and removing stains from leather furniture can be a cinch. With a little patience and preventative care, you can keep your leather furniture soft and gorgeous. It’s important to note that leather furniture is thicker and has different dyes and finishes than handbags and clothing. This means that the cleaning techniques used for leather furniture should not necessarily be applied to other leather goods. The best place to start is by reading the manufacturer’s care instructions or checking its website. The company will know its product better than anyone, and it will provide the best cleaning methods for its furniture. As with most products, not following the manufacturer’s instructions can void any valid warranties. Prevention and preparation are always good ideas. If you have a leather cleaning spray or wipes on hand, you can treat a stain right away. Additionally, using a leather conditioner regularly will help to diminish scuff marks and stop the leather from drying out. Most leather conditioners also provide a small amount of protection that can help stains from immediately soaking into the hide. Before you begin the stain removal process or general cleaning, test your cleaning method in an inconspicuous spot, such as on the back, behind the skirt, or under a cushion. This way, if the method doesn’t work, you won’t have a blemish in a highly visible spot. Unlike other materials, water should be used lightly with leather. If leather gets too wet, it can shrink, wrinkle, or otherwise be damaged. It’s important to clean up water quickly and encourage drying when water is spilled on leather or when you’re removing stains. The methods needed for removing stains from leather vary based on the stain type. Whatever method you use, it’s always best to be gentle with leather to preserve both the material and the dye. That being said, any type of stain treatment is rough on the leather and may dry it out, so it’s always a good idea to recondition the area with the stain from seam-to-seam after cleaning. If a stain is particularly large, old, or difficult — or if your test area doesn’t respond well to the process you’re using — consult a professional as a more rigorous stain removal process and re-dyeing may be needed. For fresh, non-oil-based ink stains, use a small amount of alcohol on a cotton swab and very gently dab the stain. Be careful not to soak the leather as this may affect the leather dye and finish. Clean the area with a damp cloth then use a dry cloth to dry the area. If the stain is gone and the dye is intact, condition the whole area from seam-to-seam. For best results, you’ll need to treat any grease stains from food, hair, and skin while they’re still fresh; otherwise you may wish to consult a professional. Blot up as much grease as possible with a paper towel or clean cloth. Gently wipe the area with a baby wipe, leather-cleaning wipe, or a damp cloth with a dab of conditioning soap to lift the grease. Be careful not to soak the leather. Use a dry cloth to gently rub the area until the leather is dry. If the stain remains after the spot dries, shake a generous amount of cornstarch or baking soda on the spot and let it sit overnight. Brush it off will a clean cloth. If the stain still remains, consult a professional. 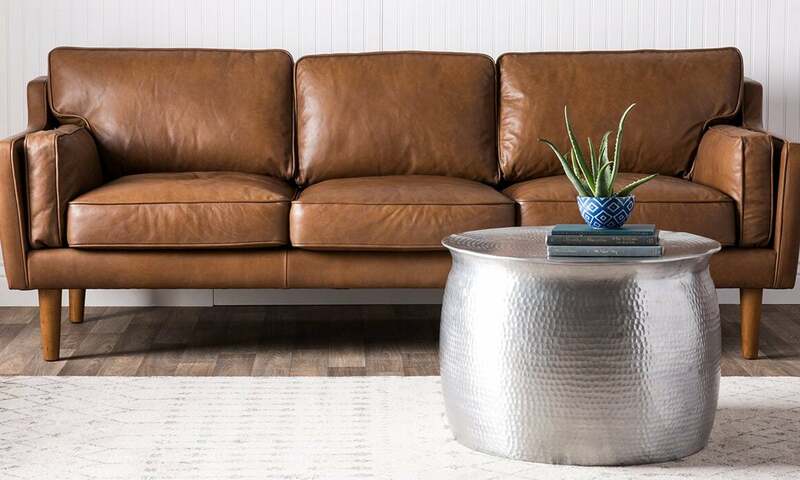 Immediately soak up any clear liquid spilled on leather furniture. If the area is soaked, keep blotting and use a fan until the spot is dry. If any water stains remain, take a damp cloth and lightly wipe the whole area from seam-to-seam then encourage drying. Use a leather conditioner from seam-to-seam to restore suppleness. For fresh stains, blot up any excess liquid then use a damp cloth with a dab of mild, conditioning soap to clean the area. For dried stains, mix a solution of equal parts water and white vinegar. Soak a clean cloth in the solution then squeeze it out so the cloth is only damp. Gently dab the solution into the stain and let it dry. If water marks remain, wipe down the whole area with a damp cloth then gently rub with a dry cloth until the area is dry. Apply leather conditioner to the area from seam-to-seam. Immediately soak up any excess wine with a paper towel or clean cloth. Use a damp sponge with conditioning soap to gently wipe the area. Next, use a clean cloth to dab the area until dry. Repeat as needed then condition the area from seam-to-seam.